Hey all! How was your Christmas? Was Santa Claus good to you? Did you eat tons of ham? I’m sure you devoured some good dessert too! 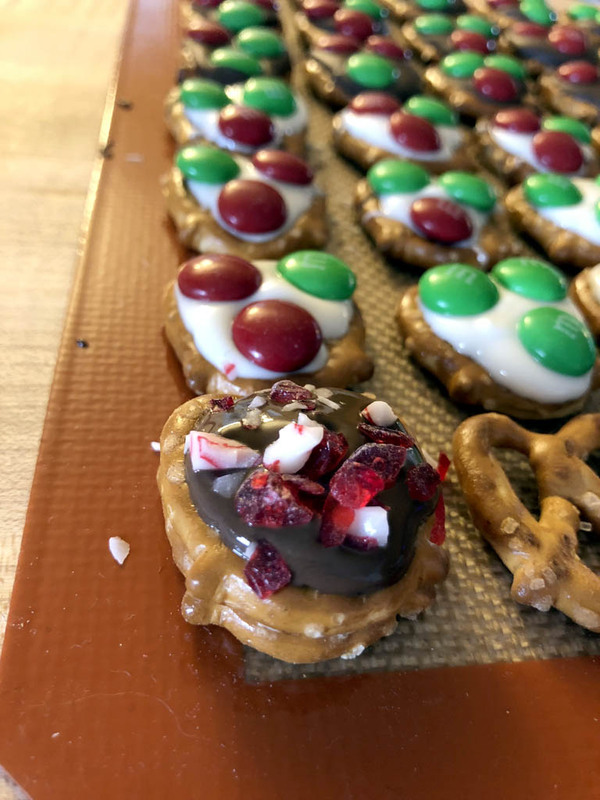 With New Year’s oh-so close and a lot of you are probably thinking about your dieting strategies, I’m squeezing in this last post of 2017 because I want to get these festive pretzels in to ring in 2018 as a little indulgence! They are amazing and addicting! These things are a guilty pleasure of mine and for a lot of friends and family who love them too. 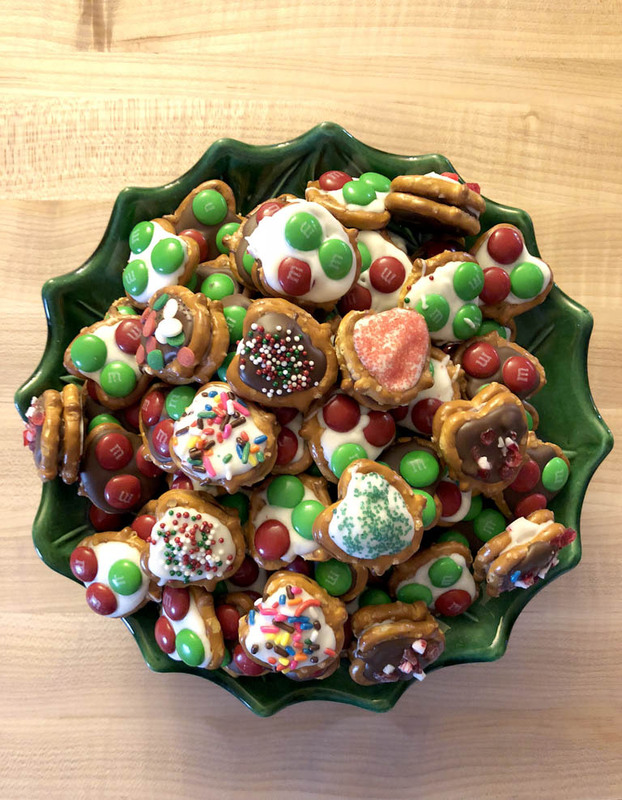 My mom made these a lot around the holidays. She discovered them at some party she attended years ago, and loved the idea so much that she started making them herself. 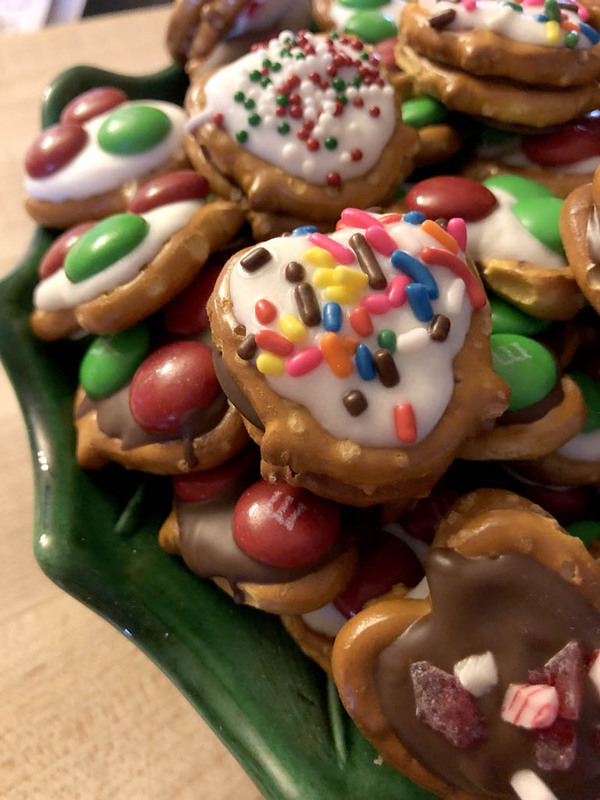 They were a hit among friends and family members, and then I jumped on the festive pretzels bandwagon. Chocolate or white chocolate, either flavor, they’re great! 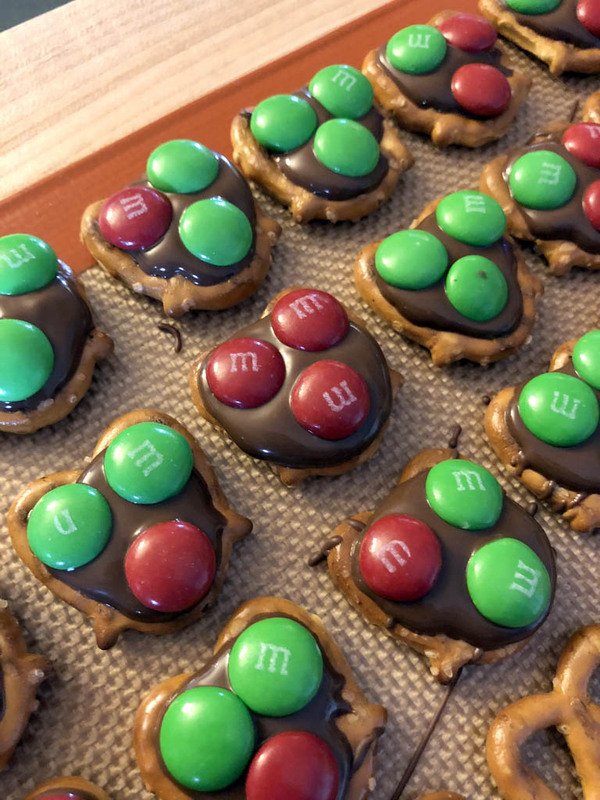 The M&Ms are like the icing on the cake. When I purchase a bag of mini pretzels I always make sure I find the bag that looks like it has the most salt. The sweet and saltiness flavor makes these easy-to-make candies a delight to devour! I make these for holiday parties, birthday parties, as wedding favors, and I even mailed them to Germany. 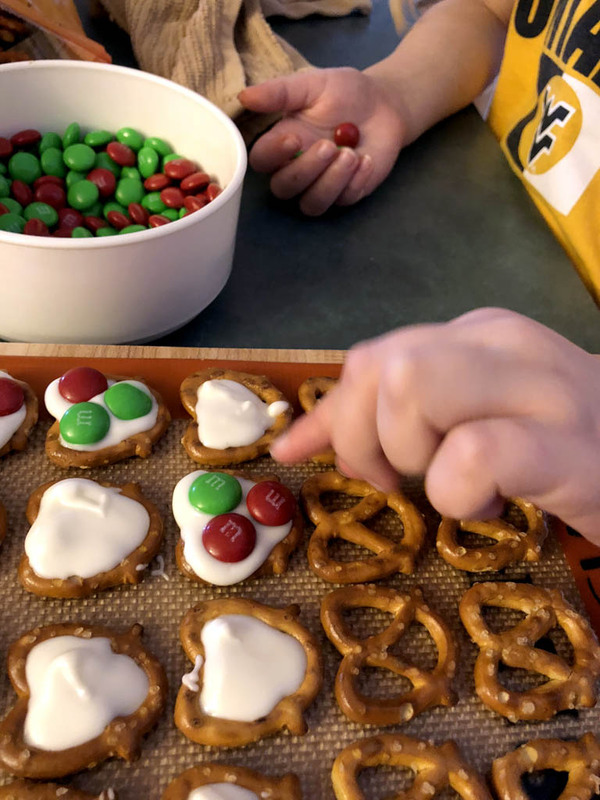 If you want to bring everyone in the world together, make festive pretzels! While making this year’s batch I wanted to try something different. I thought about doing a double-decker version. 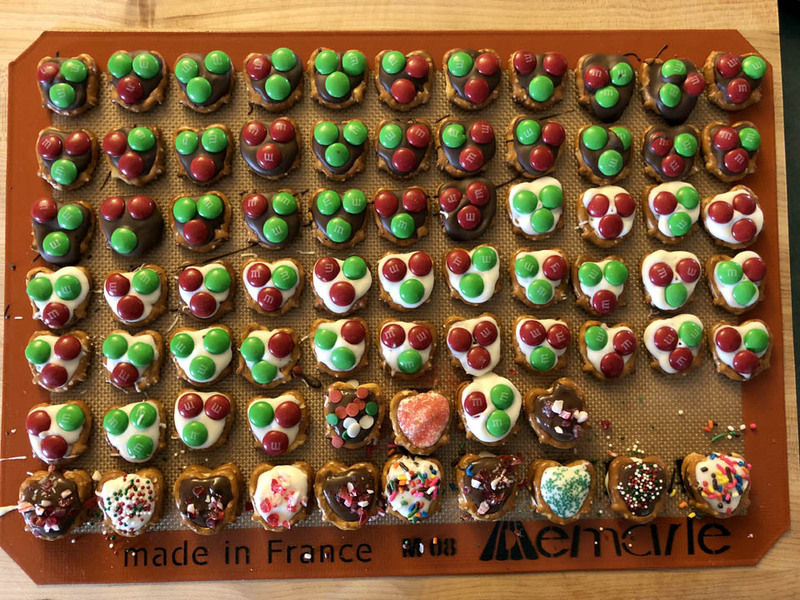 I also added other toppings: holiday sprinkles, more M&Ms, sanding sugar to add a little sparkle. My taste buds love me! For nut lovers, I’m sure chopped walnuts or peanuts would be good as toppings too! 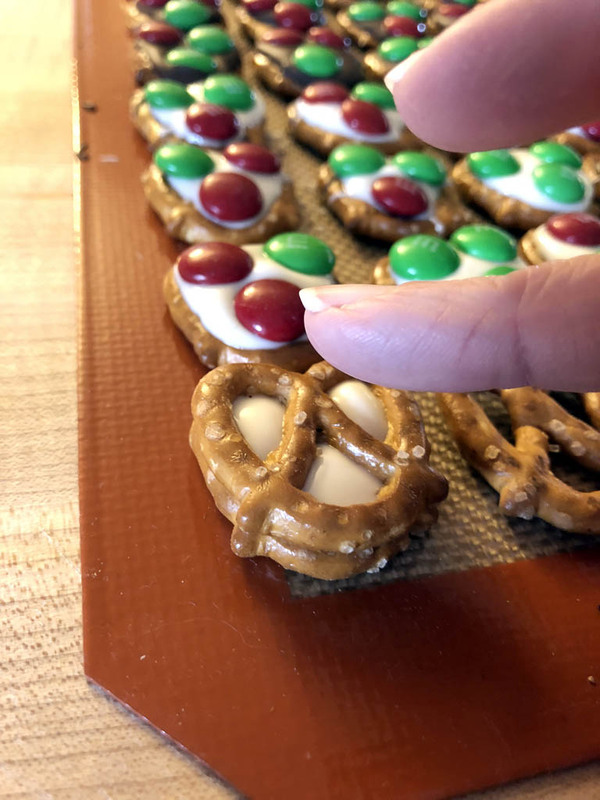 You can use either wax paper or silicone mats to place your pretzels on. 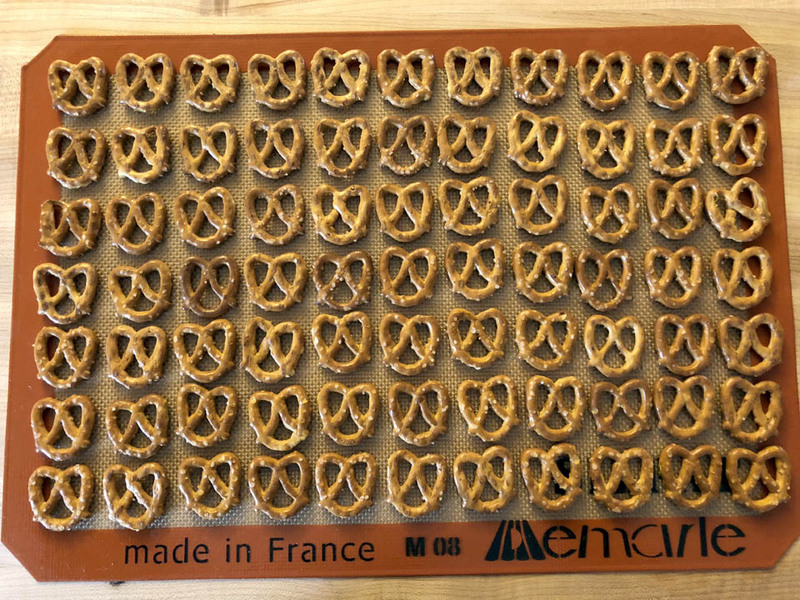 Individually place each pretzel down on the wax paper or mat. Then melt your chocolate according to the package directions. I mostly use chocolate or white chocolate almond bark, so I cut two blocks, place them in a microwave-safe bowl, and melt for 55 seconds. I’ve been doing these things for years so I stopped stirring the chocolate in between. 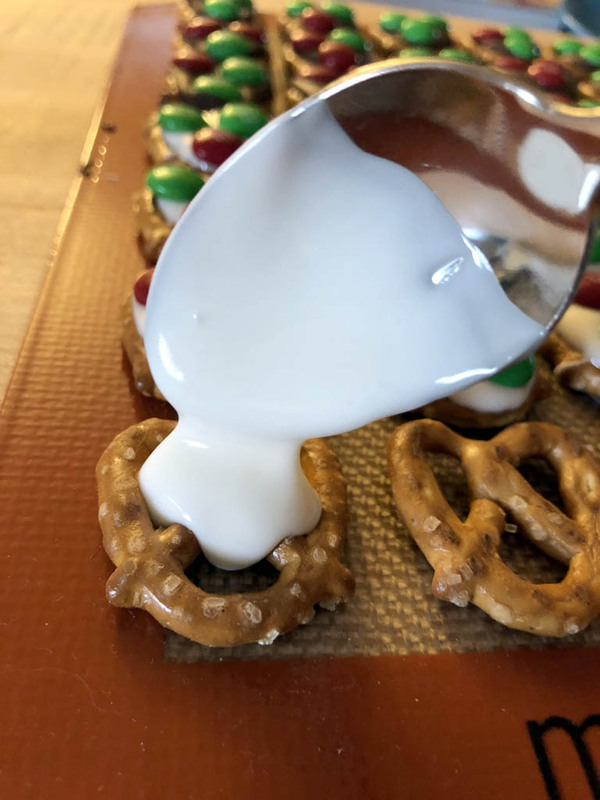 Just keep an eye on the chocolate as you melt it if you’re not comfortable with letting the chocolate melt for a certain amount of time like I do. If you find little chunks in your chocolate, you kept it in the microwave too long. It’s happened to me a bunch of times, and that’s where you learn to know an approximate melting time with your microwave without burning your chocolate. If there are not many little chunks you can still use it. 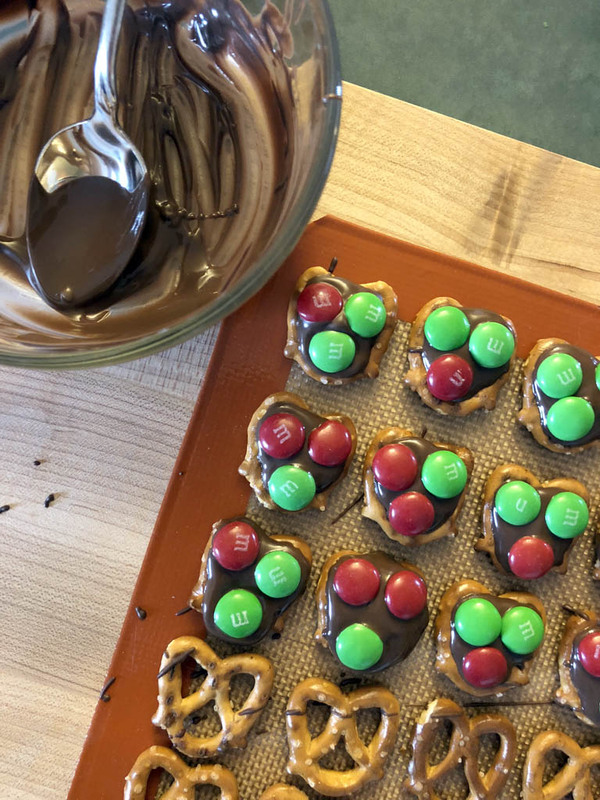 Once all stirred and melted, take a spoon and drop a small dollop of chocolate right on top of each pretzel. Then take 3 M&Ms and place each one in a pretzel hole. No need to press them too much into the chocolate. They’ll settle in nicely. Now the hard part: waiting until the chocolate sets completely. Once set, you can place them in a bowl and share them with your guests, or you can place them in cute decorative containers to give as gifts. 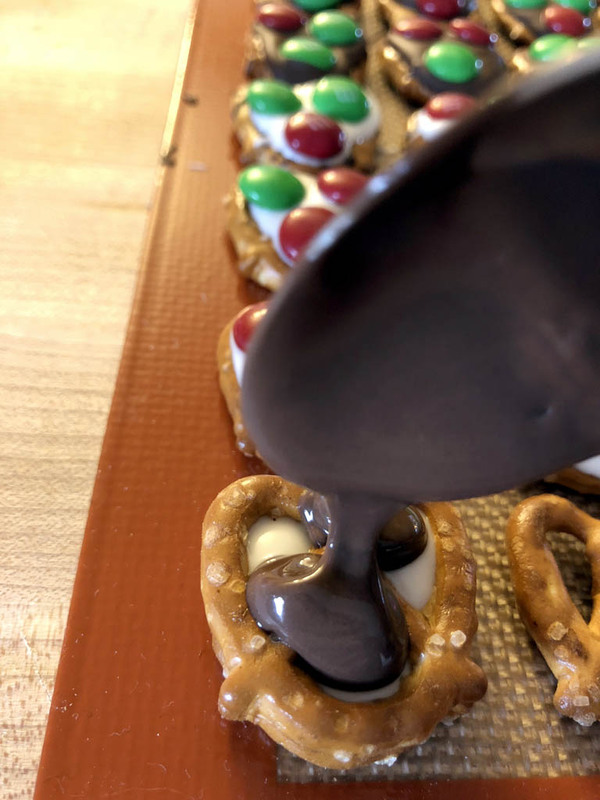 For the double-decker ones, right after adding the chocolate on your first pretzel, place another pretzel right on top and then add another dollop of chocolate on top of it. You can use the same chocolate or switch to the white chocolate. You can also make these really colorful by using the melting chocolate from your local craft store. Then add the M&Ms or other desired topping. So there you go! Easy-peasy! I hope you all have a wonderful, safe and prosperous new year, and I can’t wait to share with you even more fantastic goodies in 2018! !